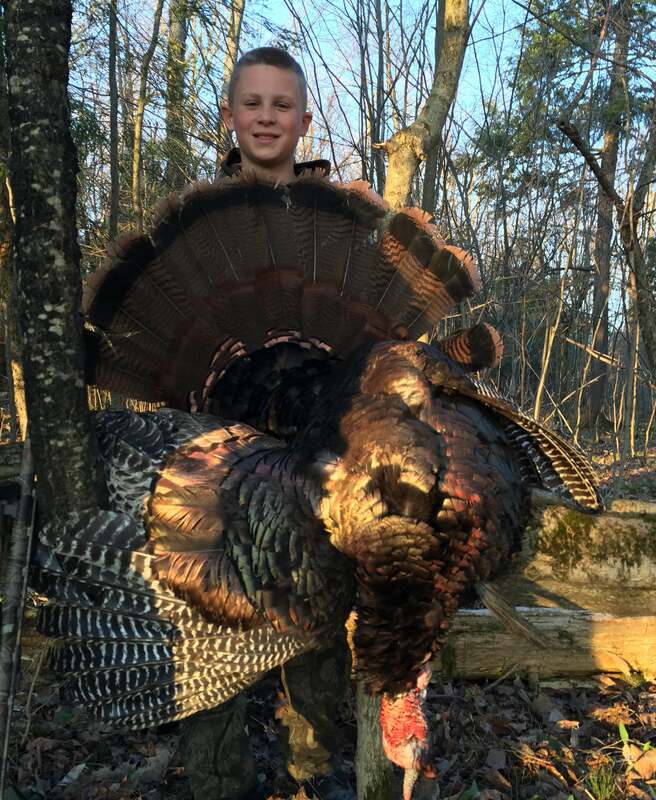 Every spring, Forever Wild Outdoors participates in the New York State Youth Turkey Hunt. It’s one of our favorite times of the year! This year was even more special as we also participated in the Ohio Youth Turkey Hunt. On April 15th, President Steve Schicker, General Manager Steve Byers, and yours truly made the seven-hour drive down to Southeastern Ohio, and met up with our good friends from Hupp Outfitters. We were invited by the Hupp family to take part in Ohio’s Youth season. 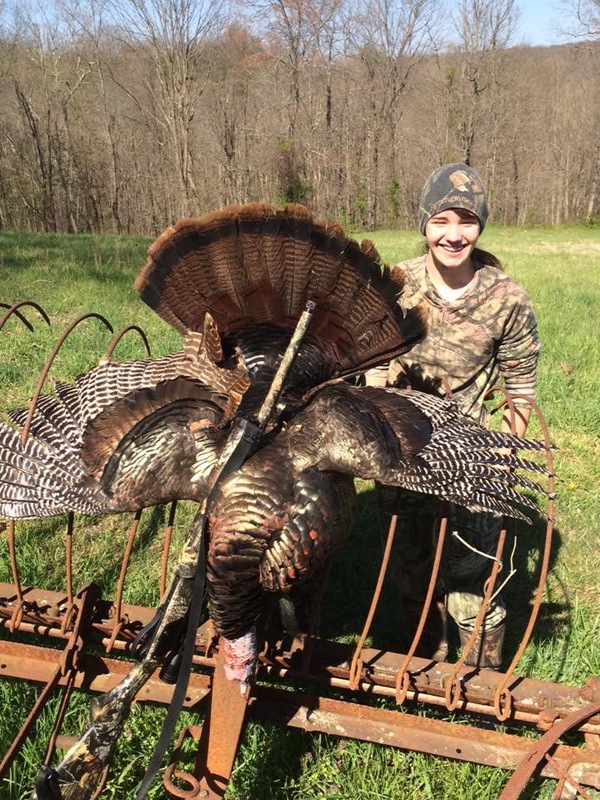 Ohio has a special two-day youth turkey season where eligible young hunters can hunt with a parent or guardian. The Forever Wild Outdoors crew made it to Meigs County, Ohio in the wee hours of the morning… 2:30 am to be exact! All of our camera gear was carefully packed and stowed away in our vehicle. Needless to say, we didn’t sleep much that morning, and by 5:30 am we were out hitting the turkey woods for a much-anticipated hunt. Three teams would be traversing the Ohio countryside, and three lucky youth hunters were excited to get a crack at some “thunder chickens” as soon as daylight commenced. I was excited, and so was everyone else! We love hunting with the kids! Our teams would be using the Pro T40 shooting sticks to help our hunters take careful aim when the moment of truth was upon them. A steady rest helps the less experienced hunters take careful aim and helps eliminate a “wobbly” barrel. Reducing movement and steadying for a shot are paramount when you’re hunting with kids. Especially since we weren’t hunting out of commercial blinds. Jason Byers, with his Pro T40, getting it done! Saturday, April 16th was very warm. Temperatures approached the low 80’s. Things were “heating up” fast, and so was the hunting! Our first successful hunter was Heather Ridenour. Heather scored on a beautiful Tom by mid-morning and our spirits were extremely high going into day two! We hunted hard the second morning. We had some close calls, but none of our hunters were able to connect. Fortunately, Ohio allows youth hunters to hunt until sunset during the special two-day season. On Sunday, April 17th, I had the pleasure of hunting with Hannah Ridenour, Heather’s younger sister. Hannah’s mom and dad were both present during our afternoon hunt, and her dad Matt also helped turkey call. We decided to hunt a totally different area that afternoon. A large group of birds were seen by another group of hunters, so we decided our chances were better hunting the newly found “honey hole”. As we got out of our vehicle, we immediately saw a group of jakes and a Tom across the road. We formulated a game plan, and decided to get “ahead” of the birds, and call to them as they approached their roosting area. We hustled to get into position, and as the first calls were made, we had birds responding to our right. 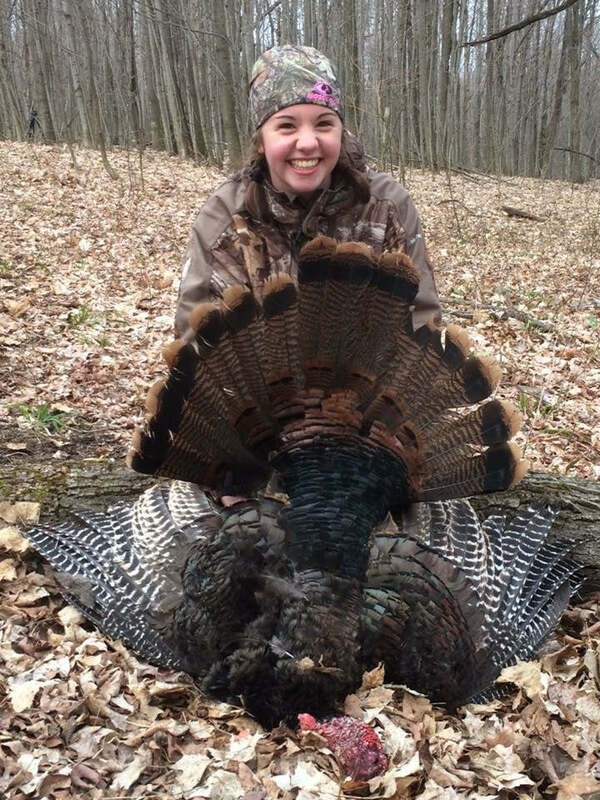 A group of four jakes popped out of a deep ravine, and they proceeded to walk out in front of Hannah, and she made a great shot on a well-earned bird. The hunt was extremely satisfying knowing that Hannah’s mom and dad were there to witness the entire hunt unfold. Congratulations Hannah! You definitely earned this bird! After a long trek home to New York, our team readied itself for a much anticipated New York Youth Hunt the following weekend. This time we would have four hunters vying for a bird. Two hunters from the state of Maine, and two hunters from New York would be trying to fill their tags. Nothing like a little “pressure” for our film crew to capture each hunter killing a turkey in two days! One of the most important members of our team is our turkey hunting guru, “Uncle Ralph” Lowry. Ralph scouts constantly for turkey, which is one of the key factors to our success in Northern New York. If you’ve ever hunted this region of the Empire State, you know that there are many large farm fields in which the resident turkeys love to strut their stuff. Optics are extremely important when we scout the large open fields of Northern New York. Binoculars and spotting scopes are an absolute necessity. Determining Toms, jakes, and hens helps us gauge the varied groups of birds scattering the countryside. During the season, it’s not unusual for our team to cover 75-100 miles per night scouting birds. We’re committed to scouting as much ground as we can, and that is why we’re so successful during youth season. April 23, 2016 was the opener for the New York Youth Turkey Hunt. Saturday morning started off with a literal “bang” as our first hunter, Jason Byers was able to punch his tag on a great Jake. The weather was markedly different from the previous week as temperatures were 30-50 degrees colder. Shortly after Jason’s jake was taken, our lone female youth hunter, Aurora Morin scored on another jake. A tremendous opening day to our 2016 youth season… two birds killed on day one. Two down… two to go! We scouted the area Saturday night, and we again located the same group of birds roosting in the exact location they were Friday night. Our plan was to sneak in to a homemade ground blind and hope the birds would do exactly the same thing as Saturday morning when Jason shot his turkey. Sunday morning was very similar to Saturday, but a little bit colder. A heavy frost was present, but the winds had died down from the previous day, so it actually felt a little warmer. No sooner had we settled in when a chorus of gobbles erupted from the woods. Something special was about happen. Just after 6:00 am, we heard a mature Tom spitting and drumming, and headed our way. As the strutting bird walked by our setup, the only thing left to do was for Nate (our third youth hunter) to pull the trigger. Two shots later, the bird was flopping on the ground in front of us! All in all, we had a tremendous youth hunt. Three out of four hunters killed turkey, and everyone hunted hard. Thanks to Vanguard, our camera gear was protected on our journey to Ohio and northern New York. Our scouting was enhanced with the fantastic Endeavor binoculars we use every day of hunting season, and our youth hunters appreciated the steady help from the Pro T40’s! As I write this blog, I realize that opening day of the regular turkey season is just five days away! I think I’ve got some packing to do! The post Youth Gone "Wild" appeared first on .